by Lindell, Michael K.; Prater, Carla; Perry, Ronald W.
Dr. Lindell has over 30 years of experience in the field of emergency management, during which time he has conducted a long term program of research on the processes by which individuals and organizations respond to natural and technological hazards. Much of his research, especially that supported by the National Science Foundation (NSF), has examined the processes by which affected populations respond to warnings of the imminent threat of a hazard. This research has been conducted in communities affected by hazards as diverse as flooding, volcanic eruption, hazardous materials, and hurricanes. Professor Lindell also has had extensive experience in providing technical assistance to government agencies, industry groups and private corporations in developing emergency plans and procedures. He has served six times as a consultant to the International Atomic Energy Agency in developing planning guidance for response to nuclear and radiological incidents, has made three presentations in National Academy of Sciences panels, and is currently a member of two National Academy of Sciences panels - Disasters Research in Social Sciences and Assessing Vulnerabilities Related to the Nation's Chemical Infrastructure. 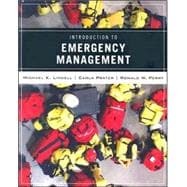 Professor Lindell has written extensively on emergency management and is the author of 70 technical reports, 70 journal articles and book chapters, and six books/monographs.